The Bahnmuseum Albula in Bergün. Climbing to Stoos. – The New Line. Discovering Swiss Happiness – Almost! Suisse sur la Deûle – en dimanches. First Impressions. Switzerland 20 – years –ago. 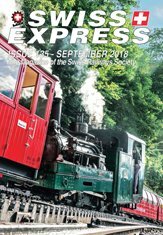 ● The Swiss Railways Society Archive and You. ● A Weekend on the Rails – Part 1. ● Modern Management of a Traditional Local Railway. ● Swiss Railways Organisational Changes. ● Hochrhein Container Terminal – Rekingen..
● Portrait of “p/s Piemonte. ● Are You Sitting Comfortably? ● “Wilhelm Tell” – a Name with a Great History on Lake Luzern. ● An American in Switzerland. ● What Gotthard do we Mean. ● A Short Trip on the CJ. ● A Weekend on the Rails – Part 2. ● GDPR – the SRS and You. 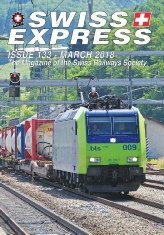 ● Les Chemins de Fer à Voie Ètroite de la Suisse Occidental. ● ms Bürgenstock – High Speed to its Namesake. ● Lost Lines near Zürich. 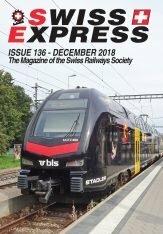 ● Swiss Long-term Passenger Service Planning. ● An Appenzeller Bahn Veteran. ● Top Tip – Eating out on a budget. ● A Class 92 in Basel? ● CHF12m restoration for the ‘Stadt Luzern’ . ● Too Much Snow – The Avalanche Winter. ● Bordering on the Quirky. ● The Crumbling Edge of Quality…..
● September Steam in the Jura. ● Stoos – Seaking the Stoosbahn! ● Special Day – Special Meal. ● Fifty Years of the Blonay – Chamby. 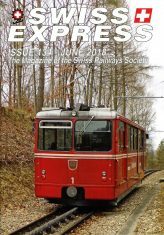 ● The Historical Railway Association “VHE Emmental”. ● Vectoring in the Vectrons! ● Autumn on the RhätischeBahn. ● Basel SBB on a Sunday. ● Swiss Railways Society (CLBG) AGM 2019.